I am really looking forward to classes at this point, and as I am going to Dublin, Ireland this weekend, there is more incentive to be excited about being over here, school and life, in general. Today in British Life and Culture we tried a variation of British foods in addition to learning how to make a cup of tea the proper way for a working class person and a middle class person. After our tea lesson, that I might touch on more later, we took a break. After break we came back to find, at least 10 different foods to try. Foods that are essential to English culture. We got to try the foods and write down what we either thought about them, what we thought they were made of or where we thought they originated. Some of the foods represented were; Cheddar Cheese from Cheddar, England, Marmalade, Pork Pie, and Black Pudding. You know me, I tried them all and liked everything except the marmalade that was both salty and fishy, weird. 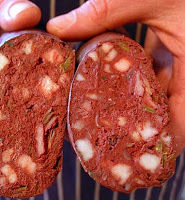 I even enjoyed the Black Pudding, AKA Black Sausage, AKA Blood Pudding, AKA, Pigs blood encased in intestin casing. MMMMMMMMMMMMMMMMmmmm. Actually, it wasn't bad. Lyndon said he grew up on the stuff. After lunch we came back and watch the movie : Saturday Night, Sunday Morning. It was alright. 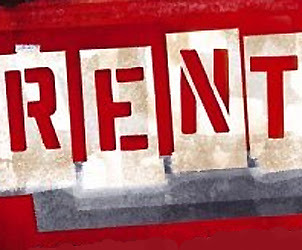 Tonight we went to see RENT at the Duke of York Theatre. I Loved it, but I can't say the same for my roommates, who in my opinion have narrow minds and narrow taste in the Arts. Give me football and givem Hell kind of attitude; if you know what I mean. If you haven't seen RENT, you should. But, that is just me. 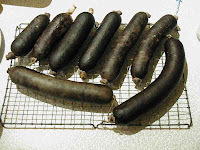 Black Pudding, as you can see is in sausage form and has spices and other herbs mixed in it. If you have had a classic sausage in intestinal wrap, you would get chewy-ness of the outside. Pork Pie, tastes like scrappel with a pie shell. I liked it. But, I would have liked it warm rather than cold as they served it. as we anxiously await your daily blog.